People often comment, "You're so fit, you must eat very little." The truth? I eat A LOT more than you can even imagine...lol. Life is for enjoying, so indulging in food is part of living, but being smart about how you indulge is the key to enjoying lots of food while staying in shape. So this video was created to show you that I’m only human and I do indulge, indeed. If you come with me anywhere, you’ll always find me where the food is. Anyone who’s ever gone out with me can attest to this. I simply LOVE food (who doesn’t? ), and so I had to quickly learn how I could indulge and still stay in shape. Is it possible to travel, dine out, attend events, indulge and still stay in shape? Absolutely! …I also workout “hard” 3-4 times a week, no more than 30 minutes per workout. By “hard” I mean I don’t like wasting time. I like to keep it short and intense to maximize my time and burn some major calories. I like to exercise in a way that greatly speeds up my metabolism and keeps my fat-burning mode on a high all day. Because I allow myself many “cheat” days, I really make sure to clean up my act on the “clean” days. Eating clean for me means no fried stuff, cooked oils, creamy or buttery stuff, ooey gooey cheesy stuff, processed foods, and foods overly high in sugar or sodium. No artificial flavors or sweeteners, “specialty” coffee or alcohol. Food preparation method should be steamed, boiled, baked, broiled or roasted. Eating clean also means eating balanced, well-portioned meals throughout the day so you don’t experience hunger or overeating, and you provide your body with all the nutrients it needs. Our body needs the 3 essential macronutrients: carbohydrates, proteins and fats. For my meals, I try to keep my complex starchy carbs around half cup, my protein from lean meats around 4oz, and if I’m eating protein from fish (salmon, tuna, tilapia, etc. ), I like to eat a little more for the good fats. And I also make sure every meal includes lots of vegetables (the more colorful, the better, especially greens). Every body is different, so it’s good to listen to your own body, try things out or talk to a professional to learn what will work best for you. Another really important factor to eating well is to have your meals mimic nature. Roughly 75% of the Earth’s surface is covered in water. Roughly 75% of our body is made up of water. So your meals should consist of 75% water content: colorful vegetables (especially greens like spinach, broccoli, asparagus), some fruits, soups, alkalizing water such as warm Matcha green tea or water with fresh squeezed lemon. Whether it’s your cheat day or clean day, you should drink a minimum of 2-3 litres of water, especially alkalized water, as mentioned above. Drink before, during, and after each meal, and drink often throughout the day. Drinking lots of water can really help food move through your system more efficiently and aid with proper digestion, cleansing and detoxifying. Whether it be a cheat day or clean day, eat slowly and enjoy every bite. It takes 20 minutes for your mind to realize you're full. So if you eat fast and overeat all in a matter of 10 minutes, you’ll feel like crap once it all hits you pass that 20-minute mark. Not to mention, your body will have a tough time trying to break down all that food. It really screws up your metabolism and your energy level. So eat mindfully, really slow down and taste the food, feel the texture and observe the flavor in your mouth. Enjoy and savor every bite. Mindful eating leads to awareness of your body. Learn to listen to your body; it is always telling you what it needs. Breathe deeply as often as possible, especially after you eat. Your body needs energy to function at its peak. This means it needs plenty of oxygen. The kind of breathing you do on auto-pilot is only just enough for your body to live, but not enough to thrive. So if you want all the systems of your body to function optimally (in this case, your digestive system), you need to consciously practice deep diaphragmatic breathing. Do it often throughout the day, or spend 5 minutes, 3 times a day, to practice. An example of this would be to breathe in slowly for 5 counts, hold for a few counts, and slowly exhale for 10 counts. Learn to slow your breathing down, keep it long and strong in a relax manner, fill up your lungs completely, expanding your tummy, and then breathe out from your gut. What I’ve shared here are not things I do just some of the time; they are things I do ALL the time. So with this practice in motion, I truly enjoy my cheat days (or cheat moments)! Also, please keep in mind that this is a very general guideline and it doesn't really apply if you're a bodybuilder, fitness competitor, or any type of athlete who needs to eat and exercise a certain way to better perform your sport or activity. It also doesn't apply if you have other serious medical conditions and are somewhat unhealthy or overweight. If any of the latter were the case, you need to deal with those issues first with a program specifically designed for you. Once you've reached your goals, then you can play around with indulging. Now, as for the rest of you who aren't faced with the above challenges, please don't feel guilty for indulging. Don't constantly fear your weight and deprive yourself of foods you enjoy. Use my tips here as a guide to explore. Take the time to test things out for yourself. See what works for you and what doesn't. Enjoy the process of discovering how truly fascinating your body is! Penny shares a workout from her series of 10-Minute Home Workout videos as part of her "Join the Wellness Movement" campaign. This campaign was created to motivate you to "move." To encourage you to consciously choose the things in life that fulfills your overall well-being. To inspire you to stay fit, stay strong and stay well in mind, body and spirit. Join the Wellness Movement! Start here, right now, with this 10-Minute Home Workout Series 2: Back to Basics. **Click here if you missed the 10-Minute Home Workout Series 1: Step It Up. Who says you can't make veggies yummy and exciting? Get all the nutritious vitamins, mineral and antioxidants from greens such as spinach and broccoli, add nature's super awesome herbs and spices, add some eggs… and boom! 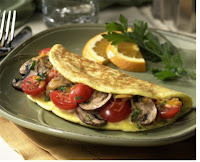 You’ve got yourself a tasty omelet. Here's a simple, healthy dish that tastes great and will keep you satiated. 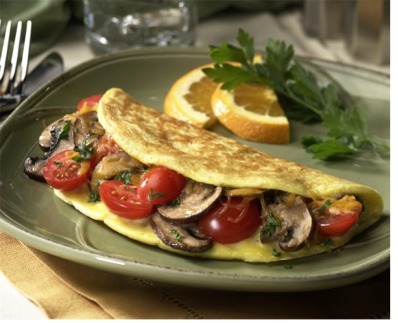 You can also substitute the spinach for broccoli, peppers, asparagus, mushrooms and so on. Feel free to steam the vegetables till they’re soft (to your liking) and dice them up into little itty, bitty pieces before placing them on your eggs. For more healthy weight loss tips, click here.